I move to Boulder in early 1996. This small city with a high quality of life is nestled into the Boulder Valley with the Rocky Mountain foothills as a backdrop to the west. Looming most prominently and distractingly are the so-called "flatirons", a geologic formation of large, prominent flat slabs of rock that jut boldly into the sky in the western foothills. The city has protected its compact, quaint size by purchasing over 30,000 acres of open space around the city (a "greenbelt"). This acreage boasts a fantastic network of scenic biking and hiking trails, many of which offer breathtaking views of the city far below in the valley (see photo of me below at a foothills trail rest stop with Boulder Valley below), as well as the continental divide to the west. A vast network of bike trails crisscross the city, as is shown by the highly popular Boulder Creek Path in the photo below in the "Transportation" section. It is a 10-foot wide paved path running alongside the Boulder Creek, and passes through the heart of the City. 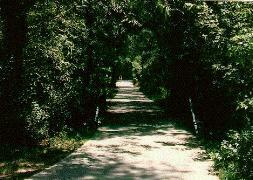 The path is largely responsible for restoring water quality and scenic beauty to the Creek, and is the pride and joy of the citizens, who regularly use the trail for walking, biking, rollerblading, jogging, and socializing on a facility that so successfully promotes a "sense of community." I, myself, bicycle on the path every day, usually on my way to work. Pearl Street Mall (filled with street performers and considered to be an excellent way to engage in "people watching"). 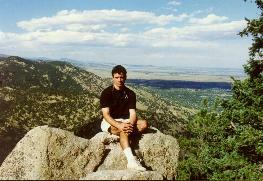 I set out on my first-ever hike on a City of Boulder Open Space trail in 1996. It is an astounding experience. There is a trail-head a mere 5-minute walk from the Victorian house I am renting a bedroom out of that takes you into this series of walking trails that run along valley bottoms and mountain ridges. The views make you feel like you're in the middle of Rocky Mountain National Park, although the large number of hikers from the city makes it a social event as well as a wilderness experience (the photo of the Flatirons at left shows one of the foothills areas I hiked). I had great views of not only the entire Boulder valley, but also the snowy peaks of the continental divide. No wonder the homes are so expensive around here. 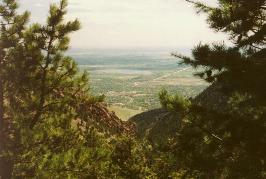 Make time to hike these trails when you visit Boulder. Each year, the City holds a wild, wacky, colorful, often risqué and political Kinetic Sculpture Race at the Boulder Reservoir. The Race is proceeded with a downtown Kinetic Sculpture parade, in which contestants proudly and lewdly show off their sculptures. Usually, they are Rube Goldberg-esque contraptions (always human-powered) designed for both land and sea. Many are designed as large, bright pink elephants, chariots, dinosaurs, and pyramids. In 1996, the first year I witness the spectacle, tens of thousands gathered at the Reservoir to watch the Race, and the Bare-Naked Ladies and Los Lobos played music for the crowd. When the weather becomes warm enough, Boulder holds a highly popular farmers market in the middle of town just off the Boulder Creek Trail. It is the biggest such market in the state, and attracts thousands of people to enjoy the diversity of quality foods and produce, and to socialize with others. It is an example of how the City has created facilities that promote a sense of community. I start in early 1996 as a growth management city planner. The Planning Department is doing amazing work, and I'm keeping very busy with my task of controlling the explosive rate of commercial, residential, and industrial development here. I'm also thrilled by the political climate, and the huge number of bike commuters (and the great facilities and incentives for bike, ped, and bus users that makes most "bike-friendly" communities look like non-bicycling communities in comparison). The big controversy here in Boulder at the moment is an uproar over a 55,000 sq ft Safeway—opponents want a neighborhood-scaled grocery. Amusing bumper sticker of the week: "I ride a bike...and I vote." Given how many people ride bikes here, such a statement is not to be taken lightly. Another one I see: "I eat tofu…and I vote." Most communities have another reason to feel ashamed in comparison to Boulder (actually, there are hundreds of reasons): Boulder has the same population as Gainesville, Florida, but has three times as many planners in the Planning Department. Not only that. Each one of them is highly competent, progressive, well-read, concerned for the well-being of the community, and respected by elected officials and citizens alike! It's always morning in Boulder! I witness a great demonstration at the office today. A researcher from Penn State showed staff a zoning code on a CD ROM disk. It was fabulous, and very much like a Web site with hot links, photos and graphics of things like signs and streetscapes (complete with overlaid dimensions), video clips with sound, cross-referencing, etc. It will surely revolutionize land development codes. At my first concept plan meeting before the Plan Board, my supervisor is making a presentation about a New Urbanist subdivision proposed for north Boulder. He lavishly praises a long list of New Urbanist principles incorporated into the design (about 90 percent of what he said was in praise of the pedestrian-friendly streets). What an exhilarating and refreshing change of pace from the non-planning going on in most communities! The auditorium where public meetings are held is impressive also. They have four high-tech, independently operated cameras that give you color close-ups of the presenters and the maps and text they are presenting—both for people at home and for people in the audience, as well as subtitles telling you who the presenter is, the issue, and the type of meeting. Very impressive. Comparatively trivial site planning issues, such as shrub placement, striping for parking lots, and setbacks (which take up most site plan review meetings in "typical" communities), are almost entirely ignored. It also becomes obvious to me during their discussion that their recommendations to the developers, planning board, and city council carry a great deal of weight. Each of these groups obviously respects the professional opinion of the City staff. Staff would call for changes to enhance the appearance of buildings for pedestrians, or reduce the size or obtrusiveness of surface parking lots, knowing that the developer and planning board would listen. I think to myself: In most communities, such comments would be considered too radical to even mention in a staff meeting, let alone in a recommendation to a developer or the planning board. Afterwards, staff apologizes to me for what they thought was a painful experience for me. I tell them it was instead pure joy. Attending my first-ever site plan review meeting before the Boulder Planning Board is also a big treat. A presentation is being made to the Board regarding a plan to create a walkable, mixed-use, neighborhood-scaled village using a Safeway Supermarket as an anchor. Two of the designers there to make the presentation are Peter Calthorpe and Walter Kulash—two of the top New Urbanist planners in the country. (In my mind, only Andres Duany exceeds these two in stature.) It is no surprise that the plan is drawing nationwide acclaim, and is being looked at closely as a test as to whether a supermarket can be designed in a livable and sustainable way. Hunting for an apartment turns out to be a lot of fun. Without exception, each person starts off by mentioning the view of the mountains from the apartment, and how sunny the apartment is. And almost everyone has dogs. (When I ask why, I am told it's because so few people have children—it would intrude on their active lifestyles—and dogs serve as a substitute.) One of the first landlords I meet is wearing this strange top hat, puffed out white collar with a large jewel, and a funny suit (all that was missing was a jeweled cane). At the end of my inspecting his place, he asks what year I was born in, what month I was born in, and my date of birth. Turns out that he is an astrologer (I crossed him off my list immediately afterward). What a kook. I should have lied about my date of birth and tried to bait him into showing off his astrological "skills." He also blunders by telling me how much he hates Boulder's traffic circles, not realizing he was talking to an enormous advocate of them (I defend them by citing research findings, but he said they aren’t in the stars). Why is it that Boulder has a much higher number of bicyclists, pedestrians, and bus riders than most college town cities, even though each of these cities have similar population sizes and university-town orientation, and even though Boulder's winters are much less hospitable than such cities in the south? (1) Boulder has installed and retrofitted several miles of striped bicycle lanes on major north-south and east west roads in the central areas of the city. In contrast, Gainesville offers a miserable experience for bicyclists on Main Street, 6th Street, and all central area east-west routes (with the exception of a short stretch of 2nd Avenue). In addition, Boulder provides a number of in-street directional signs informing bicyclists which direction to head to find a good bicycle route, has installed one or two barrier-protected bicycle boulevards in the downtown area, connects bike lanes to off-street bike paths when the bike lane ends, and has signs at several intersections that inform you that a turn is prohibited if you are in a car but is allowed if you are on a bicycle. (2) For novice bicyclists afraid of bicycling in traffic (as well as bicycle commuters looking for a pleasant and sociable atmosphere), Boulder has constructed about 80 miles of off-street greenway trails (see photo). The trails are concrete, and range in width from 10 to 14 feet. (Even at these widths, though, they are so popular that they often feel crowded.) One big reason the trails are so popular for not only bicyclists, but also walkers, joggers, skateboarders, rollerbladers, wheelchair users, and picnickers of all age groups, skill levels, and economic classes, is the provision of underpasses and tunnels which completely separate the trails from vehicle traffic. These "grade separations" make the trails significantly safer, more convenient, and more pleasant (studies find that trail use quadruples when an underpass is installed). As of 1989, there were 22 underpasses and tunnels for trails within city limits, and 15 more were planned. (In fact, I notice at least a few that are built over the last few years, even though they were not connected to an existing trail. They had been built in anticipation of future trails.) By contrast, I know of only one such facility in Gainesville: The tunnel on SW 13 Street just north of Archer Road. 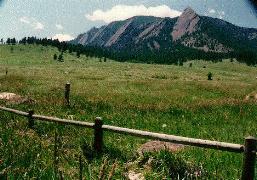 Another important feature of Boulder's trails is that they are permeable. That is, there are several spurs that link the trails to neighborhoods, and when a trail passes under a major road, there is always a spur to get the trail user to and from the road. (3) Boulder has created a world-famous pedestrian mall downtown. Each day, even during cold and snowy winter days, it is alive with pedestrians enjoying a car-free commercial corridor filled with street vendors, street performers, and the smiling faces of Boulder citizens. Unlike a number of cities where pedestrian malls have failed, Boulder has one that works in large part because of the high concentration of offices, retail and residences in the area, the proximity of the university campus, and the absence of surface parking lots (which create gap-tooth dead zones). (4) The City has an aggressive program to install "traffic calming" devices on several neighborhood and downtown streets. In place now are a number of traffic circles, speed humps, narrowed streets, necked down intersections, brick crosswalks, and diverters. (5) The City has equipped all city buses with bike racks, which not only provides bicyclists with a convenient way to get a bicycle to a hard-to-reach location, but also significantly increases the service area for buses, since bicyclists can travel much further than pedestrians to get to a bus stop. Brochures to employees describing why excessive car travel is undesirable for the community, and how beneficial it is to carpool, bicycle, walk, or take the bus. A monthly raffle drawing in which city employees who travel to work at least once a month by means other than single-occupant vehicle submit a raffle ticket making them eligible for gifts, including cash and round-trip plane tickets. A monthly challenge in which one department challenges another to see who can have the most employees travel to work at least once a month using an "alternative" travel method. This past month, the Planning Department beat the Law Department by having 100 percent participation. Not only did the director boast about it, but it won us a free pizza lunch. An "eco-pass" program, in which all employees are given a bus pass that enables them to ride the city buses anywhere within the city, as well as to outlying towns, for free. In fact, I used the pass to take the bus to the Denver airport—a one-hour drive that ordinarily costs $8 by bus. A guaranteed ride home program which provides "alternative travel" employees with a free taxi ride home in case of an emergency of unplanned schedule change. Free employee parking for employees who carpool (and a $10 subsidy per month if the carpool includes 3 or more riders). A pool car made available to employees for work-related trips during the day. A GIS-based program which gives employees a map and office phone numbers of other employees who live near them and may be interested in ridesharing. An informal policy that allows supervisors to let employees work at home (telecommuting). A policy that allows employees to opt for a compressed work week, which enables an employee to work less than 5 days per week. 19 City pool bikes located in 13 city departments, which employees can use for errands. A bike reimbursement program, which allows employees who use a bike for work-related activities to be reimbursed up to 30 cents per mile for such trips. A City policy that encourages employees to dress casually on Friday, thereby making it easier to use an alternative travel method. A free shuttle bus that continuously circles the downtown core of the city. A once-a-year "bike week," when everyone is encouraged to bicycle to work for the entire week. A number of incentives are offered to enable the City to achieve a participation rate in the thousands. There is nothing mystical about why communities such as Boulder have much higher levels of bicyclists, pedestrians, and bus riders than other college towns, and why, therefore, Boulder's urban area is safer, more convenient, and more pleasant than similar cities. Providing a full range of facilities, programs, and incentives is an effective way to reduce excessive levels of auto travel, and ensures that Boulder will have a less costly, more sustainable future. In 1990, the city population was 83,312. Boulder is the only city in the U.S. that gets part of its water supply from a city-owned glacier. It is often called the "People's Republic of Boulder" due to its leftist political leanings. Boulder's location at the front of a productive agricultural valley and the base of the Rocky Mountains provides an excellent year-round climate. Considered the technical and scientific center of Colorado, the city is home to several high technology companies, as well as the National Institute of Standards and Technology and the National Center for Atmospheric Research. Boulder boasts a wealth of culture including a symphony, music and dance festivals, and outdoor performances of Shakespeare on summer evenings.